The original little giant poultry founts have been used by poultry experts for years. These dependable waterers hook up to any standard 1/2 inch npt pipe to provide a limitless supply of clean water. Fully automatic and free of complicating gadgets, connections and adjustments. 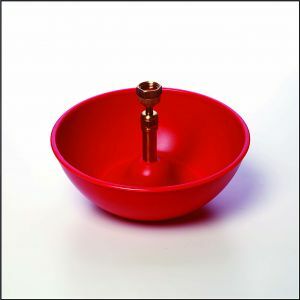 Large, heavy duty plastic bowl with non-rusting brass fountain stem. Safely operates between 20-50 psi. Holds 2 pints of water and waters up to 175 birds. Keep chickens and game birds from roosting on their water bowls, preventing debris from getting into water. Fits ALL of the Little Giant Founts. Easily attaches to top of the fount with no extra hardware needed. The original little giant poultry founts have been used by poultry experts for years. These founts do not continuously run, they have a valve that turns the fount on/off as water is consumed by the birds. 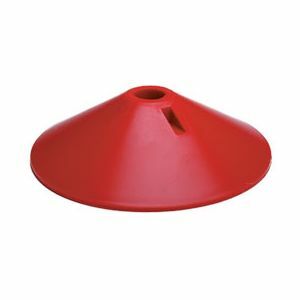 These dependable waterers hook up to any standard 1/2 inch npt pipe to provide a limitless supply of clean water. Fully automatic and free of complicating gadgets, connections and adjustments. 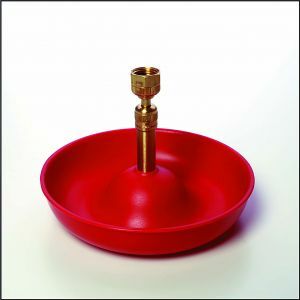 Large, heavy duty plastic bowl with non-rusting brass fountain stem. Safely operates between 20-50 psi. Dimensions 1.75" x 7.25" 6.5" x 2.5" 8.5" x 2.75"